In 1914, James Franck and Gustav Hertz performed an experiment which demonstrated the existence of excited states in mercury atoms, helping to confirm the quantum theory which predicted that electrons occupied only discrete, quantized energy states. 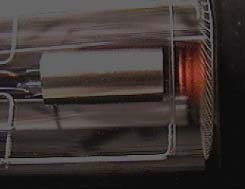 Electrons were accelerated by a voltage toward a positively charged grid in a glass envelope filled with mercury vapor. Past the grid was a collection plate held at a small negative voltage with respect to the grid. The values of accelerating voltage where the current dropped gave a measure of the energy necessary to force an electron to an excited state. Electrons are accelerated in the Franck-Hertz apparatus and the collected current rises with accelerated voltage. As the Franck-Hertz data shows, when the accelerating voltage reaches 4.9 volts, the current sharply drops, indicating the sharp onset of a new phenomenon which takes enough energy away from the electrons that they cannot reach the collector. This drop is attributed to inelastic collisions between the accelerated electrons and atomic electrons in the mercury atoms. The sudden onset suggests that the mercury electrons cannot accept energy until it reaches the threshold for elevating them to an excited state. This 4.9 volt excited state corresponds to a strong line in the ultraviolet emission spectrum of mercury at 254 nm (a 4.9eV photon). Drops in the collected current occur at multiples of 4.9 volts since an accelerated electron which has 4.9 eV of energy removed in a collision can be re-accelerated to produce other such collisions at multiples of 4.9 volts. This experiment was strong confirmation of the idea of quantized atomic energy levels. This original Franck-Hertz data shows electrons losing 4.9 eV per collision with mercury atoms. It is possible to observe ten sequential bumps at intervals of 4.9 volts. 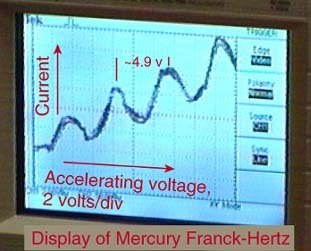 The Franck-Hertz display for mercury shown at left was formed by sweeping the accelerating voltage and recording current vs voltage on an oscilloscope in x-y mode. The measured separation of the peaks corresponds to the excitation energy of the involved mercury transition. For Neon gas, the process of absorbing energy from electron collisions produces visible evidence. When the accelerated electrons excite the electrons in neon to upper states, they de-excite in such a way as to produce a visible glow in the gas region in which the excitation is taking place. There are about ten excited levels in the range 18.3 to 19.5 eV. They de-excite by dropping to lower states at 16.57 and 16.79 eV. This energy difference gives light in the visible range. Since the accelerated electrons undergo inelastic collisions with the neon and are then accelerated again, they can undergo a series of such collisions if the accelerating voltage is high enough. The accelerating voltage from the Franck-Hertz apparatus used to produce the picture was capable of producing and accelerating voltage of about 80 volts, so you could get up to four collisions. This can be seen under proper conditions as four bands of light from the de-excitation in the collison regions. 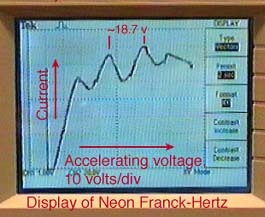 The Franck-Hertz display for neon shown at left was formed by sweeping the accelerating voltage and recording current vs voltage on an x-y plot. The measured separation of the peaks corresponds to about the midpoint of the range of excitation energies of the involved neon transitions.